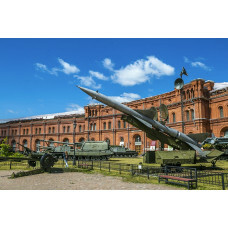 The Artillery Museum is a State-owned military museum. Since 1869 its collections, founded by the Tsar Peter I in 1703 and consisting of Russian and foreign military equipment, uniform and decorations, are hosted in the Kronverk (a crownwork) of the Peter and Paul Fortress situated on the right bank of the Neva near Alexander Park. Among the exhibits are the cannons, made by Andrei Chokhov - the maker of the famous Czar Cannon, an official chariot used for transportation of the artillery banner in the middle of the 18th century, the cannons from "the entertainment regiments" of Peter the Great, as well as personal arms, medals and gifts received by Russian Emperors, military commanders and designers of arms, trophy arms (Swedish and Turkish arms, Napoleon's personal arms).